Heart-in-a-Basket — Attitudinal Healing Connection, Inc. 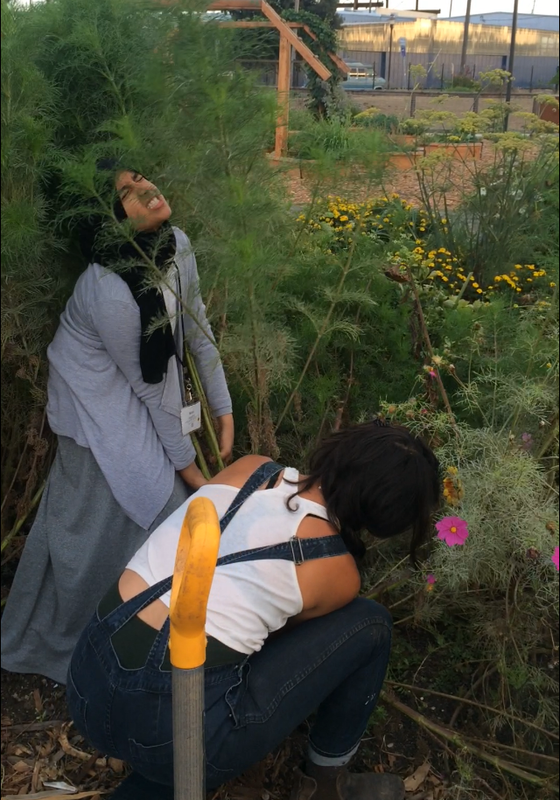 In the image above, WOLLP student, Noel, pictured in the black head scarf, channels her energy to pull out a very large weed with the help of Environmental Instructor, Neeka, pictured in the overalls. Every Tuesday, our West Oakland Legacy students have an opportunity to work their designated plot of land, converted into a garden, at City Slickers Farms. There, our students learn basic farming practices and environmental studies. Our Environmental Studies Instructor, Neeka, formulates a weekly lesson plan that highlights the interrelation of human health with that of our lands. By developing and tending to the garden, the students learn about the beauty of the agricultural process which includes: the preparation of the soil, sowing, adding manure and fertilizers, irrigation, harvesting and storage. On this particular Tuesday, WOLLP’s lesson plan was dubbed ‘Heart-in-a-basket’, where each student anonymously wrote on a piece of paper something difficult they were currently experiencing. These entries were then read aloud, discussed and reflected upon by the group. By introducing different healing and calming mechanisms to help in moments of anger, sorrow, fear, anxiety, and the like, WOLLP recognizes that our youth are experiencing a lot in their lives and it is essential that we collectively create a safe and supportive space. This activity helps students to understand the complexity of their friends’ lives; create empathy by getting a glimpse at their circumstances; get something off their chest that they might be holding in; feel what it’s like to be safe after sharing something personal; and guides them to recognize the importance of being a good friend and community member. Newer PostOUR ARTESTEEM ARTMOBILE IS AVAILABLE FOR BOOKING!